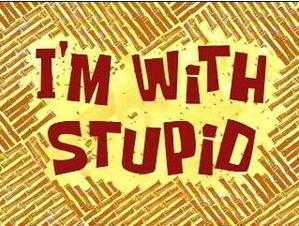 I'm with Stupid (Episode) – From SpongePedia, the biggest SpongeBob-wiki in the world! At Patrick's house, Patrick is cleaning his house. SpongeBob asks Patrick why he is doing this. Patrick then replies, his parents are coming and his parents always think of him as a stupid person. He pulls a rolled-up piece of paper out of his belly button. SpongeBob says, “Look! a note!” On the piece of paper, it shows a picture of a sixteenth note. Patrick tells him to turn over, and SpongeBob says, "Look! a letter!" On this side of the paper, it shows the letter 'B'. Finally, Patrick shows him a message. It says that for Starfish Day, his parents are coming for a visit. Patrick has to convince them that he is not dumb, and asks SpongeBob for help. He offers to pretend to be stupid for the night. The next day, SpongeBob acted stupid as ever. They actually think he is really dumb including Patrick. SpongeBob could not take it anymore and ask Patrick to have a private talk in the kitchen. SpongeBob tells Patrick to lay off the insults just a little bit. Patrick still thinks he is dumb and SpongeBob needs to prove to Patrick’s Parents that he is not stupid. SpongeBob shows them what he knows and prove he is not stupid. However, they still think he is stupid and they have taught Patrick taught him all those things. Finally, SpongeBob could not take it anymore. Patrick drove him away. Patrick’s so-called parents then reveal their real names, Janet and Marty. Patrick then said they are not his parents. Patrick’s real parents then arrived. In addition, the so-called parents then said, Oh, yeah! We don't have a son. Look closely at SpongeBob's red Karate Gear helmet. You see a ladybug in the left hole. Despite Patrick not being their son, Janet and Marty knew his name without anybody telling what his name was. When SpongeBob runs into his house as a portrayal of his faked stupidity, Squidward's house is not there. When Patrick, Janet, and Marty are talking by the Pineapple house, you can clearly see Patrick's rock from the house. Squidward's Easter Island head is no where to be seen. Apparently, Patrick has forgotten how to eat in the past as evidenced by SpongeBob saying "Oh my gosh, Patrick! You've forgotten how to eat again! Come on, we'll get the funnel!" Patrick, Marty and Janet are eating TV dinners on tables while they look at SpongeBob and when the screen goes back to them, the TV dinners and the tables are gone. SpongeBob gets mad at the end he runs through the wall. Patrick's rock is underground. Janet is a parody of Marge Simpson from The Simpsons. She has a raspy voice and similar hairdo like Marge. The episode somewhat breaks the fourth wall when Patrick and his family/SpongeBob come from the front screen. There is a closed captioning error when Patrick says SpongeBob yells "I'm ready" 3 times; the caption says "Harmony" each time. This page was last modified on 29 August 2010, at 11:37.